We assure you: the words “Barefoot Shoe”, taken together, are not nonsense. This is a real thing, and worthy of taking a look. Whether interest in these ultra-minimal shoes was first stoked by Christopher McDougall’s ultra-marathon classic Born To Run or by some other source, barefoot shoes are now a permanent part of the running world. Their idea is simple. Your feet are designed perfectly to support running. Running is something humans have always done. You don’t need fancy foams and synthetic mesh uppers to protect your feet. In fact, barefoot shoe advocates argue, those high-tech running shoes might just be hurting your feet. They encourage you to step down from those thick layers of cushioning and high heel drops, to shoes that allow your feet to do their job properly. Just a thin protective layer, the argument goes, is really all you need. Many runners have turned to barefoot running shoes for a lighter and more natural feel. Barefoot running shoes allow for greater contact with the ground, while still providing some protection against the elements. While barefoot running shoes range greatly in features, look, and price, they are all very lightweight compared to traditional running shoes. 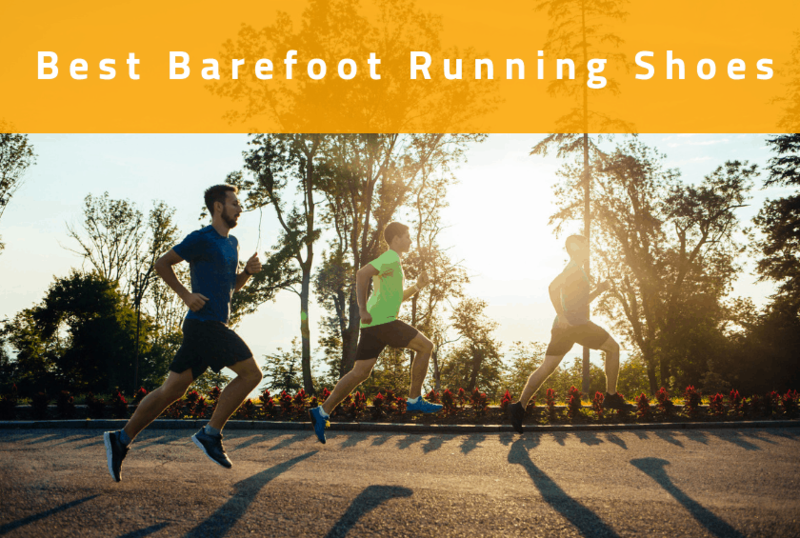 If you’re not sure whether a barefoot running shoe is right for you, start by familiarizing yourself with all of their characteristics and benefits. We’ve spent hours reviewing these barefoot running shoes and all are great choices for different reasons. Each has its own benefits, some with a more appealing design, some with better traction, and some with greater longevity. Read on for our favorite barefoot running shoes. This is the barefootest of the barefoot shoes. 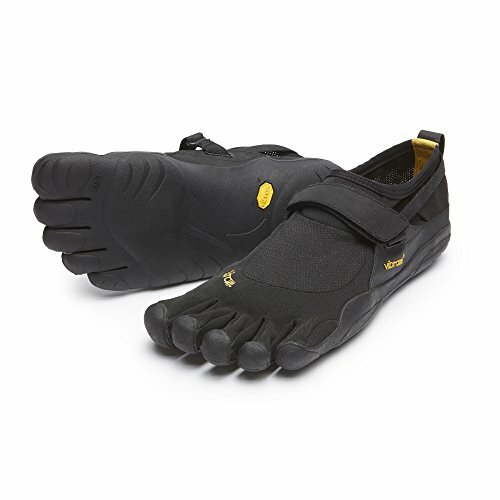 The FiveFingers KSO is one of Vibram’s most versatile and successful shoes. Engineered for traction, comfort, and durability, this shoe can be worn literally every day. From trail running and rock climbing to treadmill running and walking the dog, it does it all. The ‘KSO’ in the Vibram FiveFingers’ title stands for Keep Stuff Out. A thin stretch mesh wraps around the whole of your foot to provide unparalleled protection from rain, dirt, rocks, and more. With these shoes, you’re nearly guaranteed to return home with dry, clean feet. Why the name “FiveFingers”? Because these shoes have toes. Individual toes – five of them on each foot. Your bare feet have toes, right? So why wouldn’t your barefoot shoes? The sole features XS Trek performance rubber for superb traction, allowing you to perform at your best despite weather conditions. The sole is also non-marking, so you can wear these indoors without worrying about leaving black marks behind you. The Vibram FiveFingers KSO features a minimal design with muted colors. It’s not the flashiest shoe, if that’s your thing, but it provides everything you might want in a barefoot shoe. The Nike Free RN 2018 is designed for shorter runs. While not ideal for a long trail run or marathon, it provides excellent support for sprints and short runs while maintaining an extremely lightweight feel. This iteration of the Free RN features spandex material across the top of the shoe for a superior fit. It is also easily bendable to fit snugly in your backpack or purse. The laces pass through flywire cables to prevent pinching and increase support when you tie them. The sole provides a bit more support than typical barefoot shoes, but is lightweight enough to mimic the feeling of running barefoot. The bottom of the shoe features foam sections and texture for superb traction. 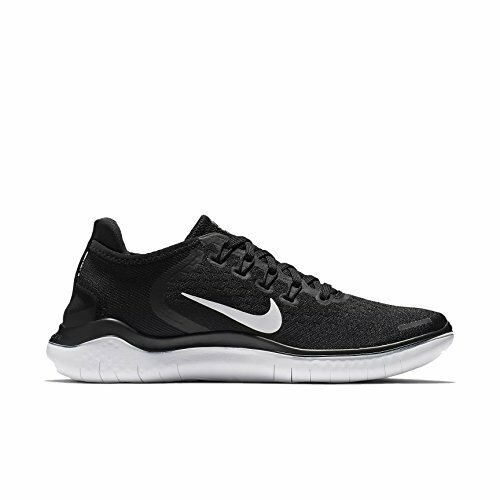 Typical to the brand, the Nike Free RN 2018 design is modern, and the shoe is available in many colors. You can easily wear this shoe from work to working out or from class to track practice. The Merrell Vapor Glove 3 provides great stability and comfort. This version features enhanced support through the arch. Equipped with a Vibram sole, it gives the runner sufficient support and provides a true barefoot feeling while providing great traction. The top of the shoe features a relatively thick mesh material to protect the foot from the elements while still being flexible. The combination of the supportive sole and the mesh top allows the shoe to help improve your running gait as you continue to wear them. The front of the shoe features a protective toe cover that prevents you from bruising or stubbing your toe when running. There is also a good amount of room in the toe box so your toes can splay naturally. The Merrell Vapor Glove 3 is sleek and comes in a variety of colors, allowing the runner to get creative with their shoe choice. Barefoot shoes excel in areas other than running, and the right pair can be a versatile addition to your fitness wardrobe. The New Balance Minimus 20v7 Trainer features a knit yarn material that offers both protection and breathability. 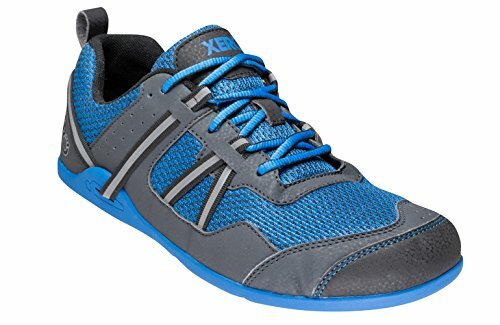 This shoe provides excellent support during weightlifting and strength training without constricting your foot during sprints and agility work. The nylon-infused yarn keeps your foot from sliding around. You’ll feel the stabilization, even when moving laterally. Additionally, the shoe collar is made of foam to adjust to the shape of your heel and prevent slipping. The sole of the shoe is lightweight and meant to help you maintain an athletic stance while weightlifting. The bottom of the shoe features a Vibram sole to help you keep your footing throughout your workout. 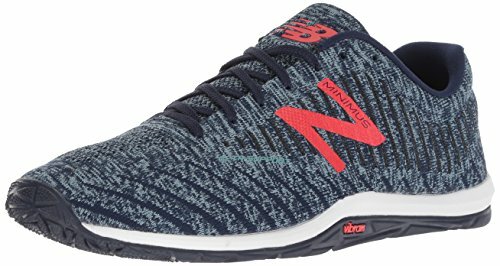 The New Balance Minimus 20v7 Trainers come in a variety of colors (many are on the muted side), allowing them to blend in with any training gear. If you do like a flashier look, there are brightly colored options as well. Made specifically for racing, the Altra Vanish-R provides all of the features you need to perform at the top of your game. 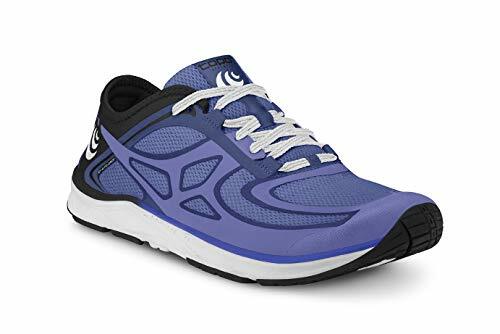 Meant primarily for road running, this unisex running shoe features a Zero Drop Platform that aligns your heel and toes to keep the impact low as you run. This shoe is meant for speed. It’s equipped with a Propel Plate feature that gives you the most return on energy exerted. Instead of absorbing your energy, the shoe springs you forward with every step. The mesh toe helps your feet breathe as you run and locks your foot into place. While it is a bit stiffer than other barefoot running shoes, it can support your foot through sprints or through an entire marathon. If you are looking for a less-cumbersome racing shoe, the Altra Vanish-R will have you flying down the track or road in no time. The Topo Athletic ST-2 strikes a perfect balance between minimalism and support. It’s a great first shoe for runners wanting to try the barefoot shoe experience but not yet fully committed. The Topo Athletic ST-2’s versatility makes it a great shoe for easy runs, races, or even cross training. The Topo Athletic ST-2 features a zero-drop heel to give you a natural feel, while providing a relatively thicker sole for added comfort. The toe box has plenty of space for your toes to spread out, maintaining comfort as you run. A breathable mesh wraps along the top part of the shoe promoting breathability and providing flexible stabilization. It also eliminates the need for seams along the top part of the shoe, allowing it to be even lighter and more flexible. If you don’t have a lot of experience with barefoot running shoes, but want to experiment, the Topo Athletic ST-2s are a great option for both road and trail. The Xero Prio is made for all day, every day wear. The shoe features heel and instep straps that secure your foot while allowing the shoe to stay light enough to wear comfortably through the entire day. The sole of the Xero Prio is made from the same rubber as Xero’s popular Z-Trek sandal. This rubber is supportive but thin enough for your feet to feel the ground. The shoe also comes with a removable 2mm insole, so you can choose how barefoot you want to feel. The Xero Prio is a shoe you can feel good about wearing. It is made of 100% vegan materials and comes with a 5,000-mile warranty on the sole. The Xero Prio comes in limited, but classic colors. These shoes are designed to be subtle enough to wear throughout your day but also feature reflective pieces, so you are safe to run or walk outside at night. The Vivobarefoot Stealth 2 is an extremely stylish and comfortable barefoot shoe. The shoe features a removable 3mm sole that gives you good support for such a lightweight shoe. Designed with unique hexagonal mesh, the Vivobarefoot Stealth 2 is breathable and flexible. Over time, the mesh will even begin to mold to your foot for enhanced comfort. Additionally, the entire shoe is seamless to prevent split seams and keep the shoe as light as possible. The Stealth 2 is a very modern-looking shoe. It is also puncture-resistant, so you don’t have to worry about ripping them when running or when you’re simply wearing them on your commute. These shoes are made from vegan materials and feature a 100-day trial for barefoot beginners, making them a great first choice for those who have not tried minimal shoes before. The Merrel Trail Glove 4 is engineered for trails, but is equally comfortable for crosstraining, walking, and running. The sock-like fit helps secure the foot through uneven terrain while still providing feedback from the ground. The shoe has a breathable mesh upper lining for flexibility and comfort. The back of the shoe provides heel padding that molds to the foot over time. The shoe features a zero-drop Vibram sole for a true barefoot feeling. However, the sole of the shoe is relatively thick (to provide comfort). For those not used to barefoot shoes, this might be a selling point. For devotees of minimalism, this might be a deal-breaker. One way or the other, the bottom of the shoe is deeply textured for superior traction in any type of weather. To help you withstand a long and uneven trail run, the shoe features a bit more protection through the toe box. 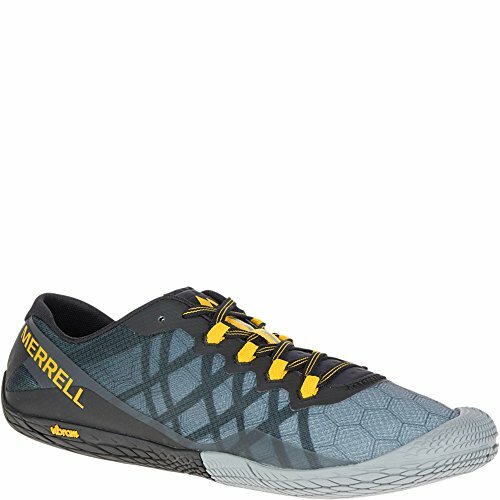 If you’re looking for a barefoot trail running shoe, this is one of the best options on the market. The Topo Athletic Runventure 2 is more of a traditional barefoot running shoe than the Topo Athletic ST-2. It’s made for the toughest of trail runs, designed to protect your shoe from the elements and from rocky terrain. Featuring a zero-drop insole, the Runventure is thin yet cushioned, to give you a little – but not too much – support while you run. A flexible rock plate lines the bottom of the sole to protect your foot from sharp rocks and rough terrain. The outsole of the shoe also delivers unparalleled traction. 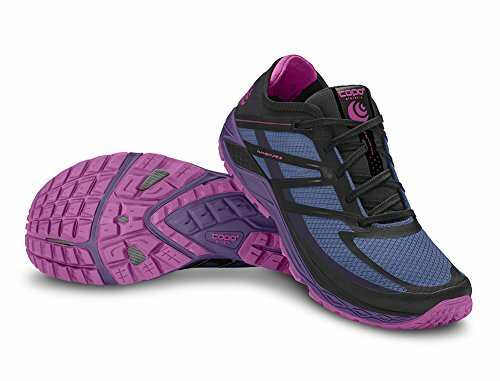 With the Runventure 2, you’ll be flying through mud and rain with no fear of slipping. The shoe is also compatible with a gaiter attachment for extra protection from mud and snow. 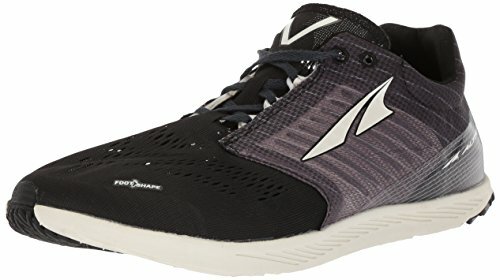 For anyone who loves backwoods trails and running in all elements, this shoe will give you the best barefoot running experience while preventing bruises and falls.